Thankfully, our fears were completely unfounded. 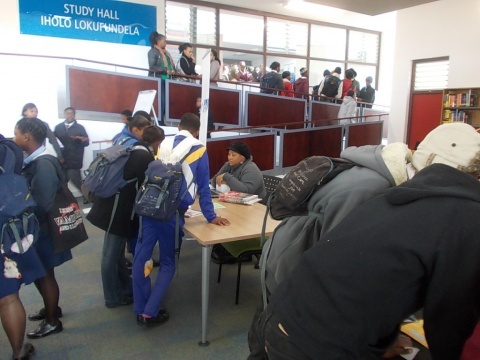 More than 2500 students braved the weather and came to the Harare Library on Friday afternoon to explore their post-matric choices. The majority of students were Grade 12s but there were also a large number of Grade 11s, some Grade 10s and even some Grade 8s. It was great to see the younger learners beginning to think about their futures from a young age. IkamvaYouth’s founding motto is one of future oriented thinking and pro-activity. The Careers Indaba is a fundamental step in fostering this mind set in the youth of South Africa. It is challenging to dream of a better future and to aspire to goals without knowing the realities of these goals and the opportunities that are available. IkamvaYouth focuses on changing the mindset of youth, to think beyond their immediate circumstances and to believe in themselves and the possibilities that their futures hold. When interviewed by The Sowetan reporter on Friday both Equal Education and IkamvaYouth agreed that this event is vital for youth in township schools and must be expanded. 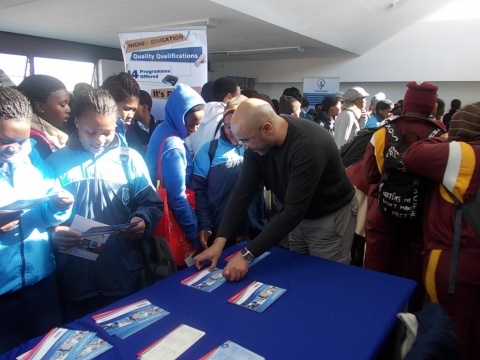 Tsepo Khanye, (NSFAS representative) also agreed: ‘This is a fantastic event and is well patronised. We need to make this bigger and longer, we need to get more youth exposed to it. Next year we should partner and hold something at Oliver Thambo hall to build on this success.’ Lets hope! It was inspiring to see that there was appreciation for the event, both from exhibitors as well as students. Many learners commented at how much they had gained from the experience. An un-named Grade 12 from Mfuleni High School commented that ‘I have so much to think about now. About my future and about how I can get there’. More events of this nature are needed to make more youth believe that there are accessible and obtainable options for their futures. 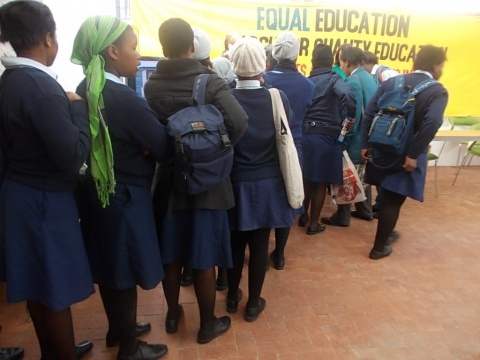 Equal Education was the partner on this event and produced amazing publicity materials and helped to organize the day. IkamvaYouth is hugely appreciative to Ntshadi Mofokeng and her team for making it happen! A huge thank you to Lulama Langeni from the Harare Library for letting us take over her space for the whole day! 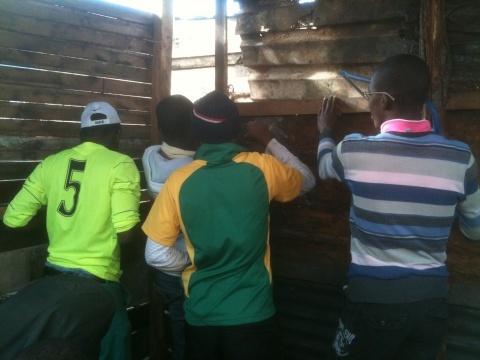 Following the devastating fire in Masiphumelele on 2 May which destroyed over 1000 homes, ikamvanites have been juggling their schoolwork and IkamvaYouth tutoring and winter schools with having to rebuild their homes and recover after losing all their posessions. Thankfully, the Masi branch has garnered support from many numerous donors, including Foschini, Masi Corp and a number of individuals (including Alex, Andy Sudermann, Philipp Schmidt, Charlotte and Tim Sun). The positive effect of these investments enabled the ikamvanites to replace their stationery, schoolbooks and uniforms, and build and better insulate their homes. The improvements have allowed homes to be functional again and a certain amount of normality is returning to these learners lives. The first stage of this project has ensured that each learner has adequate shelter in which to live and to study. I Aphiwe from IkamvaYouth just wanted to show my appreciation a big big thank you for what you guys have done for me. You give me everything I needed and I am so happy for these things that you give me. Really really thank you you guys inspired me to make a lot easier for me. Don’t give up with what you are doing. Keep on doing it. You will make a difference to South Africa. It will take long, but don’t get tired we need you. My name is Khanya Gutyana. I would like to thank you for everything you have done for me for all of us Ikamvanites affected by the fire. You helped us a lot. Some of us didn’t know where to start. Even our parents didn’t know how to begin rebuilding our lives. But you helped us. Thank you so much guys, we appreciate everything you have done for us. While men go to work, they stay home with five children and seven month’s pregnant, they move up and down the whole day looking after the children and the whole house because their love is splendid, courageous and unconditional. They carry a human being in their bodies for 9 months. They bring pure love and happiness to each and every moving skeleton they see in the street. These are the mothers of the nation, women who care for the nation; their intention in this world is to bring joy, peace, happiness and inspiration. They are the ones who change the world, they give birth to doctors, engineers and presidents but their abilities were never recognised. They are like candles in a room with lights, and those candles were never allowed to shine because the light’s brightness was strong. They were put under a shadow of darkness where no light could shine, but today they are the best seas in all oceans, they are the stars that shine in the sky. They walk with pride and dignity pulling their shoulders up and saying “I am in control.” These are the mothers of the nation, women who care about the nation. Their big hearts are being celebrated all over the world. Women who care for the nation like the late Mama Albertina Sisulu, women who fought for the nation, women like Oprah Winfrey, women who care for the nation. Those are the mothers of the nation; those are the stars that shine in the night. The world is so blessed to have my mother, your mother, your granny, my aunty because those are the mothers of the nation, women who care for the nation. 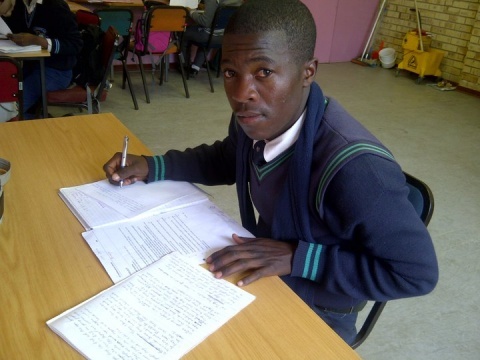 – Dieketso Boshego (Grade 11). IkamvaYouth Ivory Park. In January I started coughing, losing weight, sweating and I got sick until I was very weak. When I went to the clinic, the worse news I got, came as a shock to me that I was diagnosed with TB. I was immediately started on treatment. I visited the clinic again to get the final results after six months, the male nurse who was responsible for my file, was not there, because he was on a training course, but ultimately on the 27th of July 2011 I found him, and the best news I ever got was that, “My boy you are discharged from TB treatment, your results are clear” he said. The nurse, who received me for the first time in that clinic, told the other man who was just diagnosed with TB to look at this boy, he is such a good example, he has just completed his treatment and is cured of TB. I would like to thank all the people who were supportive during my time of shock and disbelief. I would like to encourage those who are afraid of testing for TB when they are coughing to do so and adhere to TB treatment because if I can beat it, you can also beat it. Emmanuel – IkamvaYouth Ivory Park. Grade 10.